I'm creating an introductory biology course with about 25 topics like photosynthesis and transcription. For many of these I know of a common misconception. In a face-to-face course I'll post a clicker question for students that will expose the misconception to the student before we talk about the material. I'd love to keep the ability to require activity completion and keep the responses anonymous, but still show all 70 responses instead of requiring clicks. I'm considering using Google Forms, which will provide easy access to responses and can be anonymous, but will be less awesome for activity completion. We are running Moodle 2.4. Any good ideas? I have a good idea but it's for 2.6 so not good enough if you're using 2.4. Mary might have something for 2.4. IT) Tell me, Tell me, Tell me! We are switching to 2.7 and this looks like what I have been wanting to have for quite some time. I would like the students to answer a question from their computers in the classroom and to have their response show upon the main screen of in the room. It should be anonymous to help the more silent and reserve students to have an easy say in the conversation. Are you suggesting that this may be available? It's working but not yet released. See down this forum at https://moodle.org/mod/forum/discuss.php?d=258971#p1123188. I've been using it for years. Students love it because they can participate when they are stuck at home sick by using this and the chat room. Results to the students are anonymous but the teacher can dig in and see who needs "help" if they need to. That's a tremendous plugin! I might have organized the class differently if I had known about it. I need something a bit more asynchronous and short-answer for this purpose, however. Can you post some mockups of how you envision the activity? This is from our main campus LMS, a home-brewed concoction. This is their survey tool, which allows a listing of student answers plus flexibility in questions. 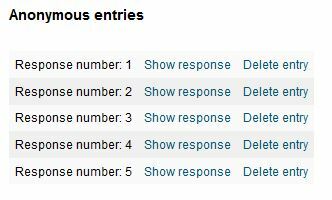 The Questionnaire plugin can duplicate what you have shown in your last entry. My example picture has responses from only two people, me and my testing student account, but you can see it its very similar to what you have. 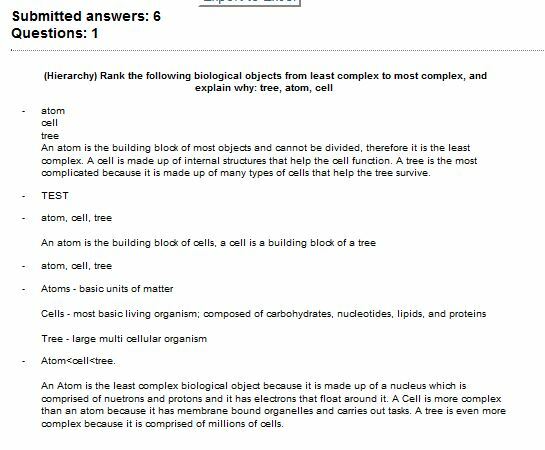 I only included the sample student answer view but the student question view is essentially the same as yours. It has some appropriate options for taking straw polls before learning activities. Is there a program that allows the student to answer the question and not rely on my supplying the answer(s)? My students tell me that they have just too many "select from the following" assessments and want to vent their own ideas. I want them to do so but I want it to be anonymous. No one should be able to know who submitted what. I have found anonymous chat rooms but they are a but too loose and I would prefer something within Moodle. There was a time when I handed out small pads and everyone placed an answer. After they were all collected, my assistant placed the responses on the whiteboard. Tedious but it allowed everyone to place an answer, not just the loudest or the first few. This was an excellent first day activity. Everyone was invited to participate. A few more classes started this way made way for much more class participation earlier in the term. It is time to do this electronically. Learners can publicly post comments, questions, suggestions, answers, etc. and then their classmates can vote on them, moving them up and down the list. Looking at the Github repo, it doesn't look like it's maintained anymore: https://github.com/hit-moodle/moodle-mod_hotquestion but I've got it working in Moodle 2.6 and 2.7 without any problems. If you get an installation error, you can just update version.php to match your Moodle version. I don't see how to grab a copy of this. You can download it from the Github link on the main project page "Download Zip"
You've hit on a good "clicker" replacement, but I would also love something that allowed short answer responses. Turns out that clicking the "Analysis" tab in the Feedback window is good enough! I had only tried the "View Responses" tab. Maybe a different type of approach but what about a Q&A forum? Pose the question and let them answer it before the video becomes available.